In memory of the deceasedlong-time Publisher/Editor of The Indigo Sun Magazine, Ginger McCord, I launched my new HoustonSpirituality.com online magazine. Although it focuses on Houston Events, the articles are universal truths. New articles and info every week. 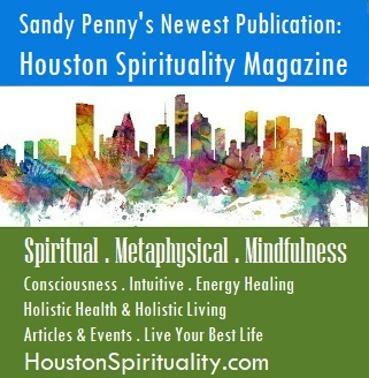 You can also check out the most up-to-date articles on the Houston Spirituality Magazine Blog. A collection of Happiness Hit videos and articles to keep you focused on joy. Musing with WritingMuse ... (my oldest blog) sharing my spiritual journey and exploration of magic, life, practical spirituality & creativity. Write and Market with WritingMuse: TIPS, TRICKS & MAGIC for Marketing Your Creative/Spiritual Business and Building Your Own Professional Website. A blog mostly for authors and entrepreneurs trying to navigate these murky internet business waters. SweetMysteryBooks.blogspot.com: My favorite mystery books, reviews and community for mystery lovers and authors. SweetMysteryBooks.yolasite.com: My favorite mystery books, reviews and community for mystery lovers and authors. Separate content from the blog. SandyPennyFavoriteBooks: My favorite books of all genres including literature, historical romance, paranormal fiction, magical realism and whatever strikes my fancy. Fresh Eyes Proofing blog: Every Writer Needs Fresh Eyes: Tips and tricks for improving your writing and reasons why everyone needs Fresh Eyes. Sun Manor Sanctuary: True stories of paranormal living including true ghost stories. Foggy Misty Memories: Personal reminiscences about life, family and whatever. Smell Taste Remember: My favorite recipes and food memories, all vegetarian with many Southern recipes adapted for vegetarians. http://simplewebclasses.yolasite.com. Website to help you build, launch, market and maintain a professional web presence at a very affordable cost. Technology Hope For the Future: Innovative ideas and inventions that are shaping the future as channeled by Sandy Penny and followed up by science. Tales from a New Mexico Writer: Stories of my life in Taos, New Mexico (I'm back in Houston now). Hurricane Rita Journal: In 2005, just after Hurricane Katrina, Houston was targeted as the destination for Hurricane Rita. I blogged the whole experience as it happened. An amazong experience. Houston Spirituality Magazine Blog for Body, Mind and Soul. Explore, Enjoy and Emulate! Share! If you would like to learn more about blogging, here are a few books to help you, and if you'd like some personal training on spiritual blogging, EMAIL ME to discuss the possibilities. Sanctuary is a half-way house for the spiritually awakening. Many mystical, metaphysical and magical events happen to the people who live there and the people who show up for Sandy Penny's help and guidance. Navigating the fine line between reality, fantasy, dementia and multi-dimensionality makes the journey a precarious and fascinating one. In Covenant of the Dove, Ana White has just been through a harrowing experience that has her family considering committing her. Ana is certain that she's quite sane and only needs spiritual assistance to sort out what happened to her. She shows up on Sanctuary's doorstep in a depleted condition desperate for completion and closure with Columb Cunradh, an Irish doctor with whom she fell desperately in love. Based on a true story, the magical realism cascades into the veiled world of the past, present and the creative plane of existence.